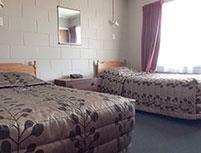 We welcome you to Otorohanga, closest town to the world-famous Waitomo Caves. The wide range of activities on offer will satisfy all age groups and complement any family holiday. Stay with us for friendly service, comfortable, spacious and affordable accommodation in a picturesque rural setting. 12 self-contained units, all of which are serviced daily. We have studios, 1-bedroom and 2-bedroom units available, all with swimming pool and spa pool access. charge-back facility with local eateries. Continental and express breakfasts are available and we can arrange in-room a la carte evening meal delivery service if required.